Federal Association of Self-employed Physiotherapists – IFK e.V. Welcome to the homepage of the Federal Association of self-employed Physiotherapists (IFK). This page gives you some brief information about our Association. Please feel free to telephone us or send us an e-mail if you have any questions or would like to know more. The Federal Association of self-employed Physiotherapists (IFK) was originally set up in 1981 as a “Syndicate of Freelance Physiotherapists” by a group of physiotherapists who as practice owners were convinced that a common representation of interests for employers and employees through one association under the same roof must inevitably lead to conflict. This basic idea, not even to attempt to perform a balancing act between the different interests of employers and employees, and instead to represent the special interests of practice owners with a clear profile, has been the central principle of the work of the Association in general since then. Clearly defined aims and precisely developed perspectives make the IFK a strong and reliable partner. Our main focus lies in ensuring adequate remuneration for the services provided by physiotherapists with their own practice, and the further development of the schedule of services in order to guarantee up to date physiotherapeutic care for patients. The IFK also represents the professional policy interests of its members on a national and European level and is thus in regular contact with health ministries, the EU Commission and health care policy in general. In addition, the IFK offers wide-ranging support to its members’ practices in public relations and provides concrete media for everyday practice, handouts and patient information. The IFK also advocates high-quality further and advanced training for physiotherapists and raising the standard of the training to university level. Furthermore, it supports the development and administration of guidelines and quality assurance criteria. Alongside this, it plays an active part in the development of professional autonomy (Direct Access) and the growth of new fields of activity (PhysioBalance). 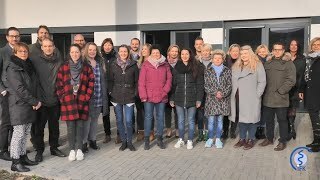 The Federal Association of self-employed Physiotherapists is centrally organised; this means that the registered office in Bochum is active throughout Germany. Numerous regional committees ensure that the flow of information to and from its members operates with maximum efficiency.